In the past, I haven't used Grief After Suicide blog posts to announce upcoming events, but a dear colleague of mine who works for the American Foundation of Suicide Prevention asked me to let suicide loss survivors know about this first-ever national conference, and I'm glad to do so. The "Our Journey Continues" conference -- for suicide bereaved people who have experienced significant healing since the time of their loss -- will be in Chicago from Sep. 9 through Sep. 11, and you can learn more about it here. • It recalls a remarkable meeting I and another colleague had with Sue in 2009, when she was exploring whether she might get involved in the suicide prevention movement. • It emphasizes something about her that I believe is vital to understanding and honoring who she is, which is that she is a person bereaved by suicide who is on a healing journey. Published November 29, 2009, with the title "Dylan Klebold’s Mom Is a Survivor of Suicide Loss"
The November issue of O, The Oprah Magazine features an essay by Susan Klebold about her journey of healing after her son's involvement in the Columbine shootings, in which 13 people were murdered and which ended in her son, Dylan, and his partner, Eric Harris, killing themselves. Klebold's essay is a study in understatement, which obscures the fact that the voice behind the writing is that of an extraordinarily courageous and insightful woman, and I fear that the most important things she writes about will be lost beneath the nightmarish reality of what happened at Columbine on April 20, 1999. While I perceived myself to be a victim of the tragedy, I didn't have the comfort of being perceived that way by most of the community. I was widely viewed as a perpetrator or at least an accomplice since I was the person who had raised a "monster." That sentence, with a few changes in wording, could have been written by countless suicide survivors whose loved ones have been seen by others as weak or misfits or tainted or crazy or "monstrous" in some other way, survivors who themselves have been treated as complicit or blameworthy in their loved ones' deaths. This notion -- that each of us who grieves over a death by suicide is "a victim of a tragedy" -- is central to my own view* of one of the complications of suicide grief; and the value of Klebold's observations about that phenomenon stems from the horrific nature of the shootings (there were 37 victims, 13 murder fatalities and 24 people wounded in the shootings), which accentuated her treatment as a "perpetrator." If she has healed as a survivor of suicide in the face of the truly awful and starkly wrong-minded judgments leveled against her -- in the most public of forums, the American mainstream media -- then her healing journey likely holds lessons for the rest of us. My interest in Klebold's story is also based on the two times that I've met her. The first was in April 2005, at the Healing After Suicide Conference of the American Association of Suicidology, which was held in a Denver suburb that year. She and I were among the 25 or so people in attendance at a conference session that closed with time for the audience to ask questions or make comments (I did not know she was in the audience, nor would I have known her if I saw her). In the middle of the Q-and-A, she stood and introduced herself, "My name is Susan Klebold ..."
I cannot recount precisely what she said, but I remember a few things very clearly: She said that she had not viewed herself as a suicide survivor for a long time after her son died by suicide because of the circumstances surrounding his death, and she expressed gratitude over discovering that point of view because of how healing it had been for her. She spoke for no more than a moment, and I don't recall her specifically mentioning Dylan or Columbine or murder, so, in fact, I was not certain who she was or what circumstances she was talking about, except that her name sounded very familiar to me. I was struck by how poignant what she said was, as is often the case when I hear a survivor of suicide loss first share publicly about his or her experience--and it seemed to me that this was the first time she had shared her story publicly as a survivor (although I didn't know that for a fact). As she finished speaking and the Q-and-A continued, I turned to a colleague next to me and said, "Susan Kelbold?" And my colleague replied simply, "Dylan Klebold's mother," and instantly I knew why the things she had said had struck me as being so powerful. At the close of the session, a handful of people, myself included, went up and, one-by-one, introduced ourselves briefly. I simply welcomed her and thanked her for being there and for sharing what she had shared. I walked away thinking, "What a courageous woman." • The purpose of the meeting, from Klebold's point of view, was to explore how she might be helpful to people who are at risk of suicide and people who have lost a loved one to suicide. • My colleague and I thought she might be tremendously helpful and were very encouraging and affirming about her possible role as an advocate for suicide prevention and suicide grief support. • None among the three of us had a specific idea about how it might be best to explore her being helpful to the field. • Susan Klebold's personal journey after the most unimaginably hellish experience of suicide loss possible is one of the most extraordinary and inspiring stories of healing that I have ever heard. • She left me with a profound sense of her courage, her humility, her strength, her wisdom, and her sincere desire only to be helpful to others. • She has great insight into the nature of suicidal behavior and the role that mental illness plays in suicide. • She is a survivor of suicide loss like any other survivor of suicide loss. • She is also a survivor of a particular type of loss, murder-suicide, that deserves more -- and more-compassionate -- attention not only from society as a whole but also from the community of suicide survivors and suicide prevention workers and advocates. One of the reasons for this post today is to state that, now, I do have a specific idea about how she might be most helpful to survivors, to which I've alluded, above: She could communicate the story of how she healed. What did she do to rise above the judgments of others? How did she first affirm herself as a victim of a tragedy and then move from there to being the survivor of a tragedy? I want to know from her the same thing I cherish knowing from any survivor of suicide: Not just the story of her loss and of where she wound up after her long and painful journey, but also what happened along the path she has traveled between April 20, 1999, and today: What specifically helped her to survive? © Monkey Business Images / Dreamstime.com / Used with permission. Psychologist Margaret Clausen's article "What Remains: The Aftermath of Patient Suicide" is a remarkable account of a clinician losing a client to suicide -- and I recommend it as a first-person report that communicates vital information on several levels. As literary memoir, it is a tragic, real-life story told in plain language. "Are you aware of the events related to Jill?" "No," my heart now pounded from my chest into my throat. "Jill killed herself by handgun ..."
I do not remember what he said next, just that he was still talking. I gasped, crying, while simultaneously attempting to hide my upset. The great Jungian, James Hillman, stated that the suicide of patients is a "wrenching agony of therapeutic practice." It is also a reality of practice that we fantasize will not touch us, despite the statistics. As an example of bearing witness to suicide loss, it covers the entire landscape. We learn that Clausen has lost two siblings to suicide, and we are given revealing insights into several of her colleague's very profound experiences with clients' suicides. Todd had 15 years of clinical experience and ... was well versed in suicide prevention and intervention. After his patient's death, he refused to ever work with a patient again who even mentioned suicidal feeling states ... His stance is maintained to this day, six years later. Answering all the questions is not the point of such a process. If there is an aim, it is the recognition that the clinician continues in relationship without her (or his) partner in the dyad. Coming out ... on the [listserv] and in this article are acts of advocacy for other therapists in a direct way, and ultimately also, I believe, advocacy for patients. Coming out in these ways are antidotes to shame as well, although revealing oneself carries with it a chance of being judged or shamed. There is ineffability ... in this kind of traumatic loss ... The suicide of a patient shatters illusions of therapist omnipotence, shaking expectations of potential positive influence upon patients, and calls into question core identity as well as identity-in-relationship to other patients and colleagues ... It rocks our assumptive world as therapists: questioning whether our endeavors are life giving, whether our efforts possess meaning and influence; and whether our chosen profession is worthwhile. Finally, I hope that survivors who have wondered about the role of their loved one's caregiver in the suicide and its aftermath read Clausen's brave and penetrating article as a source of insight into the caregiver's experience. My family's experience with my father's caregivers was one of those nightmarish scenarios where, it seemed to us, everything that possibly could go wrong, did, and very badly so. It is now more than 37 years since my father killed himself, and I was reminded by Clausen's testimony -- by her bearing witness -- that there still might be room in my psyche to invite in empathy and compassion for everyone who was touched by the tragedy that befell us. An article in a recent issue of the University of Portland campus newspaper,The Beacon, introduced me to a story about a death by suicide that was stigmatized and how the effects of stigma are unfolding in real time -- and hopefully about how stigma is being overcome. The article, by UP student Logan Crabtree, caught my eye because he tells of founding, with fellow student Jesse Dunn, an Active Minds chapter at UP "following the suicide of our friend Mike" -- and I am always moved when, in the aftermath of suicide, survivors like Crabtee and Dunn take action to improve mental health resources and services in their community. We were devastated by the news of Conner Hall’s suicide ... For me his death felt like a personal failure. I spent weeks questioning and reviewing every event, article and Facebook post we had made [during the start-up of Active Minds]. What else could we have done? Why did this happen? What else can we do? I sympathized with Crabtree regarding his feeling of personal failure, which I believe everyone involved in suicide prevention has grappled with, each of us in our own way -- and I was curious about what was happening at UP. An Internet search led me to the backstory, which is, at turns, both troubling and hopeful -- just as facing the harsh reality of suicide often is. The backstory is told by Steve Duin in a Dec. 12 Oregonian article, "Suicide and Stigma at the University of Portland." Duin's article focuses on the proposition that university officials and clergy reported Eberitzsch's death either inaccurately or ambiguously -- and ultimately in a way that infused both the death and its aftermath for the student body with stigma about mental health issues and suicide. In his homily that afternoon, Father Mark DeMott said, "We will never know what happened in the middle of the night on Highway 26. It may have been an accident. It may have been intended." 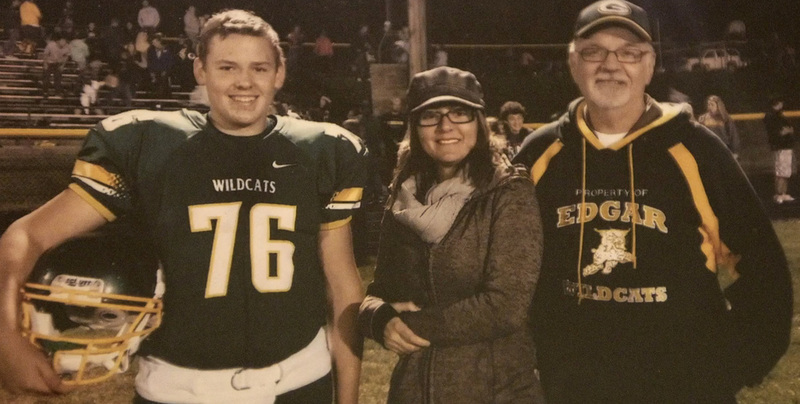 But there was no ambiguity about the cause of Eberitzsch's death: He had posted a suicide note on Facebook at 1:45 that morning -- and then in the dark of night turned his car into the path of an oncoming log truck. In what could have been a perfect opportunity to have an open dialogue about the risks and consequences of depression, our University has opted to sweep it under the rug. Fast forward to the present, and -- led by the advocacy and action of the school's Active Minds chapter -- it seems that change might be afoot. The Beacon publishes a regular "Let's Talk" column, inspired by Dunn and Shorma's editorial in March. Poorman has been clear and straightforward in communications, sadly, about two subsequent suicides among UP students -- and he has convened a panel to review the school's mental health services. Many are critical that the health center on campus remains understaffed during this crisis. Many need more than emails from Mark Poorman. 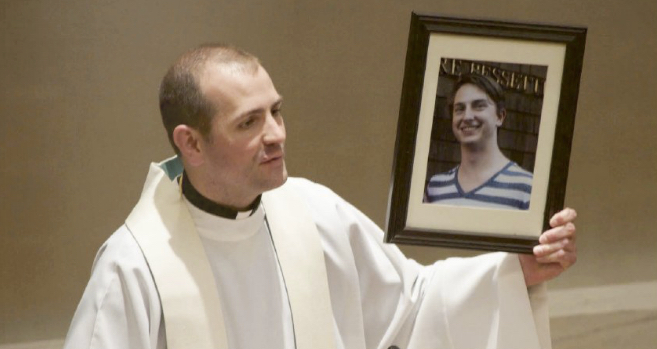 This small Catholic university has confronted four suicides, three by students and one by an alumnus who worked as a night custodian. Passions are running high, as they often do in the wake of suicide. Reading through the comments posted to Druin's story makes it abundantly clear that the community -- UP students, parents, faculty, staff, and the wider circle of people affected by these tragic circumstances -- are shocked and frightened. Even Eberitzsch's mother, Debe, weighs in on this public forum and accuses the university of not sufficiently helping her son and of mishandling the communications about his death. What is happening at UP is nothing more or less than exactly what the aftermath of a series of suicides looks like in a small community, and it demonstrates how stigma affects what happens next. Dunn and Shorma showed wisdom beyond their years when they observed that there was "a perfect opportunity to have an open dialogue." I can only add that the opportunity has not yet passed -- but that it will. "Survivor Outlook" shares the voices of survivors of suicide loss whose experiences with grief and recovery have been reported in the news. To learn more about the survivors quoted, follow the links to the complete stories. Learn how you can suggest a story. An infographic tallying the 2014 suicides in Larimer County, Colo., shares a fact about each person's life. In Fort Collins, Colo., there's a small-town newspaper, the Coloradoan, that is making a big impression on me. Executive editor Lauren Gustus and her staff are covering the issue of suicide in Larimer County in as wise and sensitive a manner as I've seen, and I recommend the fruits of their labors as an example of a valiant effort to tell the whole story about the horribly difficult topic of suicide. This, however, is more than great journalism (although it is all of that), for the Coloradoan is declaring its commitment "in the coming weeks and months ... to create a focused community conversation on this issue" -- and it seems courageous to me for a newspaper to lead the way like this, especially in a community where the suicide rate is 25 deaths per 100,000 people, which is twice the rate of suicide in the United States. Please go to Gustus's introduction to the Jan. 15 issue to find links to the dozen articles, videos, and infographics that begin the Coloradoan's coverage. Their passions, talents and dreams are a legacy their loved ones remember every day. That loss is personal -- something not to be exploited in our community’s search for answers. Whether in the form of a letter, essay, song or something else completely, the Coloradoan wants to hear how suicide -- recent or historical -- has affected the residents of Fort Collins and Larimer County. Topics for written submissions include but are in no way limited to the following: What’s been your experience with suicide? What hurts the most about it? What should people talk more about? What is the biggest misunderstanding people have about suicide? What has the healing process looked like for you? That seems like a wonderful way to start a conversation about suicide -- in Larimer County or anywhere. * Note: I did not include the link to the form, since its purpose is to invite feedback from people in communities served by the Coloradoan, but since USA Today owns the Colorado newspaper, maybe this is an idea that will find its way up the chain of command and "go national." As a mother, no matter how many counselors, doctors and friends tell you suicide isn’t the parent’s fault, you can’t help but wonder what you did wrong. I was shocked ... I watered it every day, but it continued to drop needles, and every day I felt more distraught. I had neglected Derek’s memorial tree. I had failed to take care of it properly and now it was dying. The metaphor was obvious. It seemed almost fitting that the tree would die under my care. The story does not have a happen ending. The tree dies. Why, then, is the story worth telling? ... it’s a sad truth that you can’t always prevent everything, and you can’t blame yourself. I'm grateful for Linda's story because of how it helped her discover a very difficult part of her truth related to her son's death. She encourages us to believe that -- no matter how different our stories are, and no matter how various are the conclusions each of us draws about the suicide of our loved one -- there can be great healing in the very act of telling our stories. 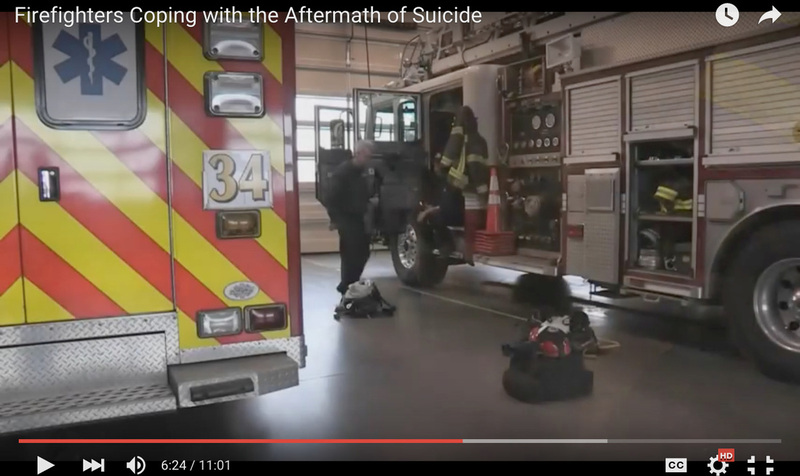 The short video Firefighters Coping with the Aftermath of Suicide takes an intimate look at how suicide affects firefighters, both because they respond to suicide attempts and fatalities and because suicide strikes among their own ranks. Please share the video with your local fire department (here's the short URL: youtu.be/QSH5EbNhJBA) and encourage firefighters to watch it (it's 11 minutes long). This is a prime example where I was not aware of how that would affect me personally. This particular call ... is really a hotbed .. I am at the latter part of my career, so it's like things are showing up out of the blue, and I have read about that, but it can really happen. Dan Mulroney, South Metro Battalion Chief, tells a moving story about how he started working on the issue of suicide prevention after revisiting the suicide of a colleague 20 years earlier. I went back now 20 years ago to relive the situation, to ask the individuals that were involved how they felt nowadays -- and I got such an emotional response from them that I knew I had to get involved in this and try to help -- because I had people crying about it still after 20 years. • The After a Suicide Resource Directory lists resources for first responders on helping the bereaved at the scene of a suicide. Firefighters, they're a tough breed, but they're human too, and they have emotions -- and those emotions can be affected. I don't care how tough they are. I'd like to add one more post to Grief After Suicide in 2015 -- to share with people who offer assistance to the suicide bereaved a video that inspired me to set an aspiration for the New Year. In Laura van Dernoot Lipsky's TED Talk, "Beyond the Cliff," she touches on an idea that we who have a role in facilitating the healing of others hear a lot about -- namely, the need for caregivers to take good care of themselves to ensure that they are healthy and whole as they render assistance to others. ... how critical it is that we continue to strive to cultivate our capacity to be present. One of the reasons we want so much to be present is we remind ourselves with everything that is out of our control every single day, one of the things that remains in our control at any given time is your ability to bring your exquisite quality of presence to what you are doing and to how you are being. That presence we know can interrupt the systematic oppression that is causing so much harm and can transform the trauma that is arising. It is both enlightening and of great value to hear all that van Dernoot Lipsky has to say about the vital role that being truly present plays in transforming trauma in the lives of others. But the main point of her talk is how we, as caregivers, must "transform the trauma that is arising" within ourselves. As I said, her talk inspired me to set an aspiration to be more present to whatever is unhealed within myself; and I am deeply grateful to van Dernoot Lipsky for reminding me so eloquently that it is vital for me to look anew at the age-old admonition "Physician, heal thyself." This year's final post on the Grief After Suicide blog features what I believe is an extraordinarily wise reflection on grief from Dr. Robert Neimeyer, a world-renowned expert on bereavement who is also a suicide loss survivor (shortly before his 12th birthday, Neimeyer's father died by suicide). 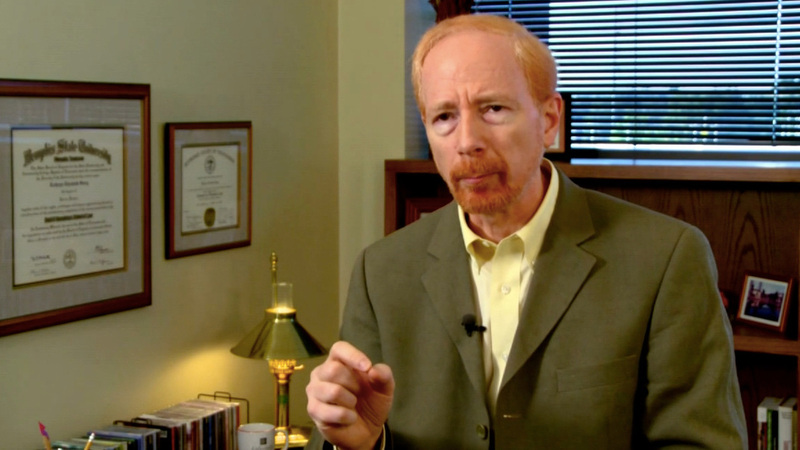 His comments were recorded for an AfterTalk radio special shortly after the Paris terrorist attack on November 13. I think that a first step might be to distinguish what is grief from what is not grief and to recognize that grief in the presence of suffering and loss is an appropriate response to a tragic circumstance ... to recognize that there can be complicating emotions and behavioral responses ... Sometimes the problem comes with seeking a hasty solution ... to a circumstance that really requires a longer-term response. Neimeyer alludes to one requirement of a longer-term response being space for sadness and mourning. In 2016, the Grief After Suicide blog will be dedicated to helping people bereaved by suicide find, create, and share the healing space we need to focus on grieving our loss.